Fuelsearch: Oil tanks at Essar’s oil refinery complex in Gujarat. New Delhi: The diversified Essar Global Ltd plans to spend a record $2 billion (Rs7,912 crore) on developing oil and gas fields in India, Myanmar and Nigeria to benefit from high fuel prices. The Mumbai-based group will use about $200 million of its own cash and borrow the rest for the three-year spending plan, Shishir Agrawal, chief executive officer of Essar Exploration & Production Ltd, said on Wednesday. An almost threefold rise in crude oil prices in five years makes it attractive for companies to buy and develop energy assets overseas. Essar is looking to bid in Africa, Central and South-East Asia, and India, Agrawal said. Crude oil futures in New York have gained 34% in a year and reached a record $83.90 a barrel on 20 September, the highest since the contract was introduced in 1983. Developing two fields that Essar acquired in Myanmar in 2005 may cost as much as $1 billion. Another $500 million is needed for the Ratna fields, off India’s west coast, Agrawal said. At least $60 million may be spent on surveying an area in Nigeria, he said. The overseas fields will help secure crude supplies for Essar Oil Ltd’s refinery and natural gas to generate power for the group’s steel plants. “The group will have a hedge," Agrawal said. “Even if we don’t import it for our own consumption, we can swap" cargoes with other producers, he said. “Our energy requirement is... high and growing." 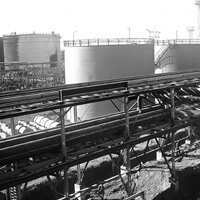 Essar Oil, India’s newest refiner, started its plant in Vadinar in Gujarat last November and expects production to reach the full capacity of 10.5 million tonnes (mt) this quarter, Ruia said. Essar Global, which owns India’s third biggest steel maker, plans to spend about $6 billion to raise production more than five fold by 2012. Output will rise to as much as 25mt a year, said Ruia, who is also the managing director of Essar Steel Ltd.
Essar Global will increase annual output at its Canadian unit, Algoma Steel Inc., to 4mt and is also building a 2.5mt-a-year plant in Trinidad and Tobago, he said.